A female superspy is the star of Agent Jane Blonde, an espionage-themed video slot from Microgaming. This cartoon adventure is a simple one. Played using a 5 reel, 9 payline reel set, it comes with wilds that double payouts and a feature round that awards up to 30 free spins complete with a 3x multiplier. Play this classic game on your PC, tablet or mobile from between 9p and £45 per spin. The design here is done like a comic strip. On the reels you’ll see lower value sunglasses, cocktail shakes, gadgets, lipsticks and guns. The higher paying symbols show an assortment of female spies in a variety of different scenes. The agent with the gun is the best payer. Land 5 on a payline and you’ll win just over 83 times your total bet. As you might expect, Agent Jane Blonde is the game’s wild. As well as replacing all other symbols bar the scatter, she can deliver some big payouts herself. You can look forward to an award of 1,111.11 times your bet if you land 5 on the same payline. Hope to see Jane combine with standard symbols to create a winner too as this results in a 2x multiplier boost which doubles the payout. The Agent Jane Blonde logo is the scatter. Land 3, 4 or 5 of these anywhere on the reels on the same spin and you’ll receive a payout of 5, 20 or 500 times your total bet. You’ll also trigger the game’s Free Spins feature and with it, 15 free games. All payouts during the feature benefit from a 3x multiplier and are trebled. Landing 3 or more scatters on the same free spins results in a retrigger and another round of 15 free spins. If you add in the 2x multiplier wild, payouts will be subject to a 6x multiplier if a wild in involved. You won’t find anything very flashy in Agent Jane Blonde. Both the design and gameplay have a retro feel. The Free Spins feature has the potential to be a good on thanks to the 6x multiplier – you can win over 3,407 times your bet on every free spin. Variance wise, it’s in the middle. 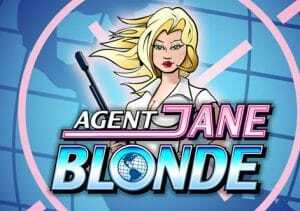 Agent Jane Blonde is a simple but enjoyable enough game. If you’re after some straightforward action then this secret agent adventure is a decent enough place to start. If you want big multipliers, the illusive 300x multiplier in NextGen Gaming’s 300 Shields should provide a good challenge.